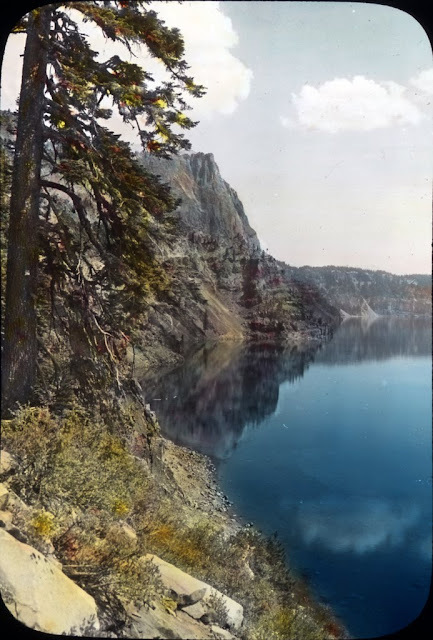 June 12, 2018 /Photography News/ 165 years ago today, on 12 June 1853, John Wesley Hillman was reportedly the first European American to see what he named "Deep Blue Lake" in Oregon. 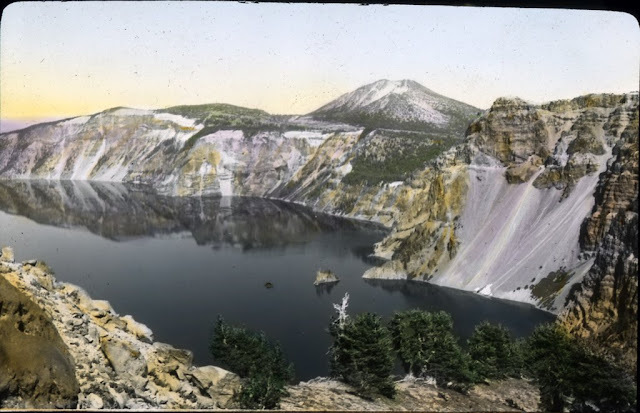 The lake was renamed at least three times, as Blue Lake, Lake Majesty, and finally Crater Lake. 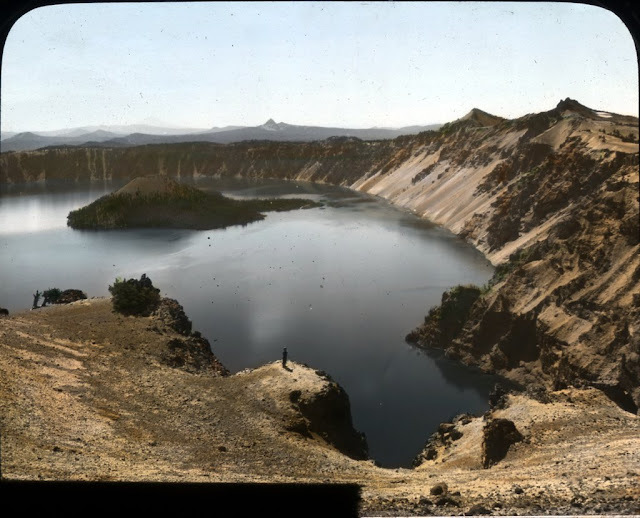 The Oregon State University Press published a great book on the park entitled "Crater Lake: A History," by Rick Harmon, and the 1916 text on the Crater Lake set from “Pictured knowledge: visual instruction practically applied for the home and school” by Calvin Noyes Kendall and Eleanor Atkinson is available on Google books. Photographs and text courtesy of OSU. 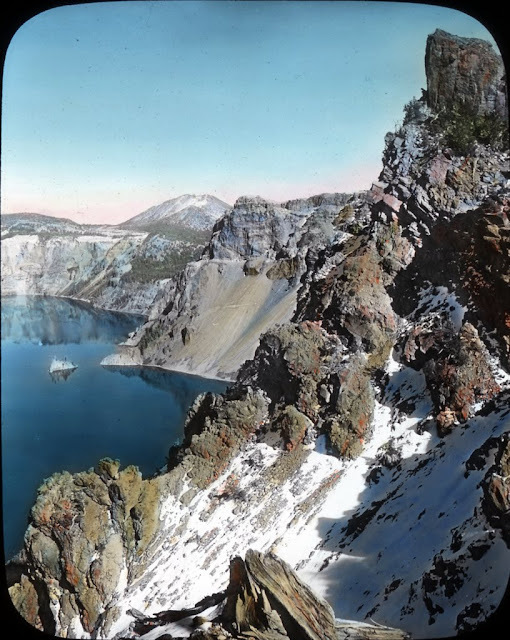 Image Description: "Here is an inspiring view of Crater Lake – that which is left of grim old Mt. Mazama – the deepest and bluest lake in the world. It measures two thousand feet in depth and the intensity of its color is almost unbelievable even while you look at it. Many Alpine lakes are blue under some lights. 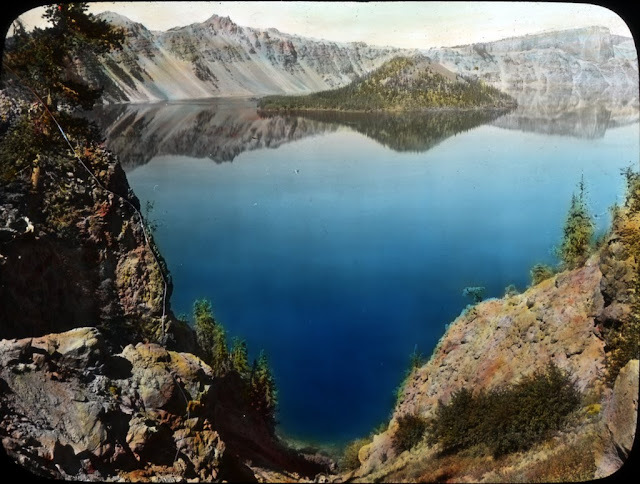 The deep blueness of Crater Lake may possibly be due to mineral which the water holds in solution; yet a glassful of the water is as clear as the clearest. 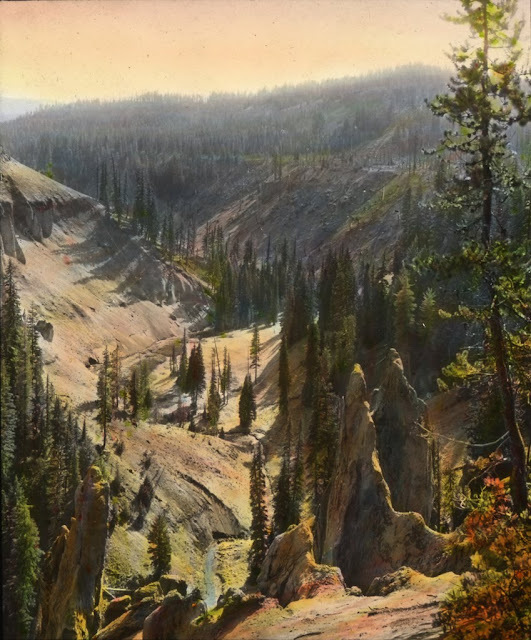 Its cliffs from skyline to surface are a thousand feet high, and its color may be due in part to these surrounding walls and to its enormous depth. From the rim, a narrow margin of the water along the walls appears to be sea-green. The lake has no visible inlet or outlet as it occupies the great cavity left by Mt. Mazama when it disappeared into its own depths. It is a gem of wonderful color in a setting of pearly lavas relieved by patches of pine-green and snow-white—a gem which varies in hue with every atmospheric change and every shift of light. 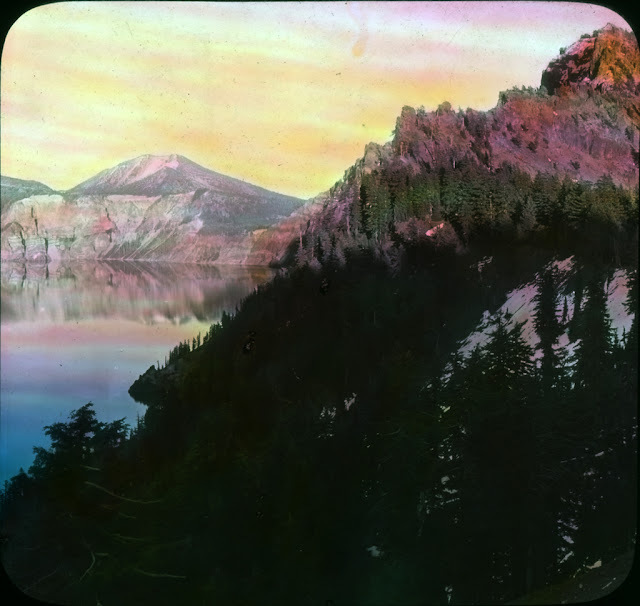 Because of the unique character and extraordinary beauty of this lake called by Joaquin Miller, 'The Sea of Silence,' Crater Lake National Park was established in 1902." Image Description: "According to the legend of the Klamath and Modoc Indians the mystic land of Gaywas was the home of the great god Llao. His throne in the infinite depths of the blue green waters was surrounded by his warriors, giant crawfish able to lift great claws out of the water and seize too venturesome enemies on the cliff tops. War broke out with Skell, the god of the neighboring Klamath Marshes. Skell was captured and his heart used for a ball by Llao’s monsters. But an eagle, one of Skell’s servant, captured it in its flight, and a deer, another of Skell’s servants, escaped with it; and Skell’s body grew again around his living heart. Once more he was powerful, and once more he waged war against the God of the Lake. Then Llao was captured; but he was not so fortunate. Upon the highest cliff his body was torn into fragments and cast into the lake, eaten by his own monsters under the belief that it was Skell’s body. But when Llao’s head was thrown in, the monsters recognized it and would not eat it. Llao’s head will lies in the lake, and white men call it Wizard Island. And the cliff where Llao was torn to pieces if named Llao Rock." 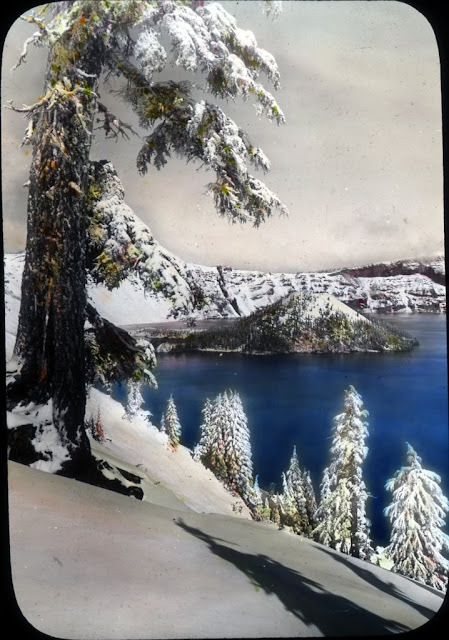 Image Description: "Here is Dutton Cliff on the southeast shore, with the so-called Phantom Ship is a volcanic island masted with rock spires and decorated with a few scattered evergreen trees. From a number of points it has the appearance of a ship but under certain lights and shadows “The scene changes magically while you watch” and the ship blends so completely with the walls beyond that it vanishes." Image Description: "A close view of Wizard Island in the lake near the west shore. It is a perfect little volcano – a crater within a crater. Although a few pines are growing upon it, the island’s lava and ashes appear as if just cast from the internal furnace. The island rises several hundred feet above the lake-surface, and it’s crater is eighty feet deep. 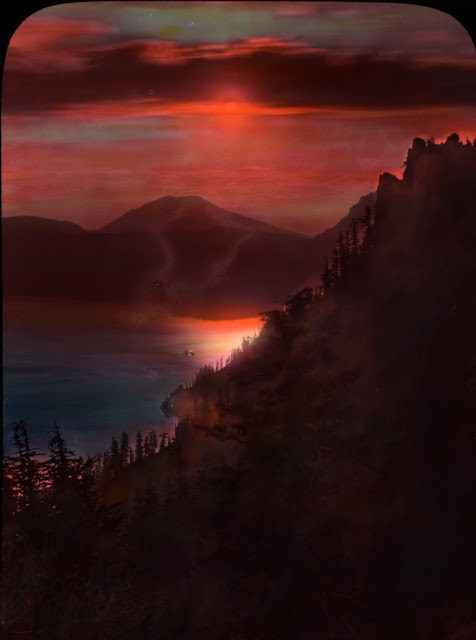 The island is a good view-point at noon, at evening, or when the blue cold crater glows and sparkles with the reflected fires of a million fiery worlds." Image Description: "And here, it seems are gathered together bits of many wonderful scenes in this marvelous park and blended into one by the colorful tints of a glorious sunset." Big "wow" factor with these pictures. Just incredibly beautiful. Oregon is just LOVE! Amazing photos. The first one looks like a painting. Eye catching landscape. I must be framing some of pictures which I took in Portland using All Custom Framing at Wholesale of Vancouver WA. Some of the beautiful landscapes from Oregon. Just love these kind of natural landscapes sceneries. Hope to visit Oregon this spring after attending a festival in Louisiana lol.